Five Star Trails Gainesville & Ocala | Florida Hikes! Concentrating on hiking trails found within an hour of either community, Five Star Trails Gainesville & Ocala shows off both urban woodlands and wilderness trails in a diverse mix of habitats throughout a four-county region. With 38 hikes, many appearing in print for the first time, the book includes a mix of easy walks and longer day hikes. 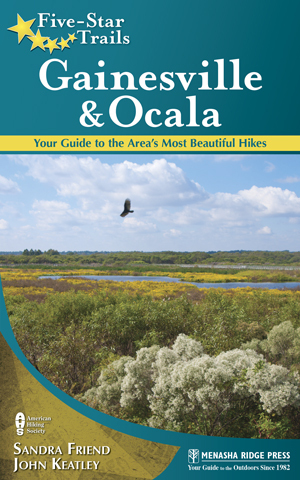 It includes some of our favorite hikes along the Florida Trail in the Ocala National Forest and on the Cross Florida Greenway. Important: Since publication of this guidebook, the dog policy in the Ocala National Forest has changed. Dogs are no longer permitted on the trails at Juniper Springs Recreation Area, or at any trail that goes near any spring or swimming area. The list of hikes below is what you’ll find inside the covers of this guide. As promised in the Appendix to this book, the following links enable you to download the GPS tracks we collected to make the maps in this guidebook. All were collected with a Garmin Oregon 400t or Garmin Dakota 20 and annotated in Garmin Basecamp. Right-click on the download link and use “Save Link As” to save the GPX file to your computer. Please respect the availability of these GPS tracks for your personal use only; do not upload them to other websites. Thank you! The image links lead to galleries for each hike on our Flickr site so you can take a virtual hike before hitting the trail. You can purchase this guide online or patronize a Florida bookstore or outdoor retailer to pick up a copy.